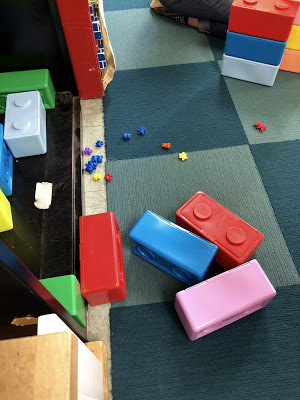 This post is cross posted from Teacher Tom’s blog. See the original post. There are a couple boys in our 3’s class who still struggle with the temptation to knock down the constructions of others, so I was loudly narrating my own activity by way of making sure they knew that this tower was “my tower” and it was not a “knocking down tower.” Naturally, this drew something of crowd. “It will fall,” declared one of the onlookers. “Yes, it will fall,” agreed another. They weren’t taunting me, but rather simply stating a fact. 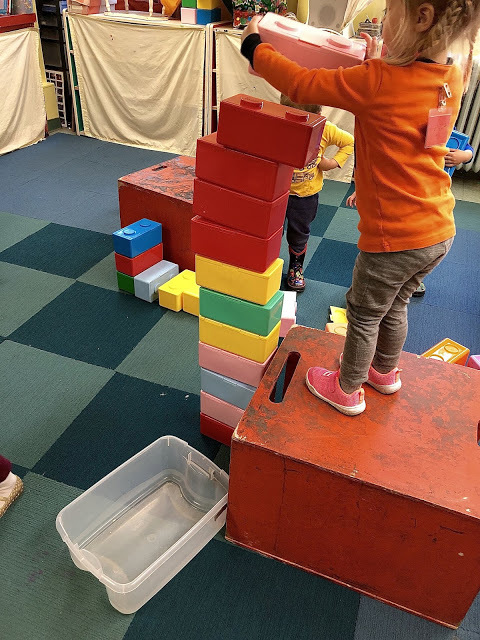 Every preschooler knows that there is a limit to how tall she can build a block tower, and if she doesn’t yet know, she soon will. She knows that there is a height limit imposed either by physics, her own capabilities, or the designs of others. Indeed, she knows that this is the destiny of everything she builds with her playthings. And she knows that this doesn’t just go for her, but for everyone. It’s part of the human condition. Of course, that doesn’t mean she won’t continue to try to stack blocks to the ceiling or the sky or to outer space. On the contrary, for many of us, that’s exactly the point, to challenge ourselves, to see how far we can go before it all comes crashing down. We learn quite young to not cry when our buildings fall, unless it comes at the hands of others like the boys who are still tempted (which is why I was working to “teach” the lesson of “not knocking down”). In fact, for most of them, most of the time, the response is to laugh, often giddily, sometimes even wildly. Many, once they’ve recognized the inevitable bending back toward the earth are even eager to help it along, giving it an extra push. As an adult it’s impossible to not see this as a metaphor for all human activity: everything we build will fall. We may someday build that tower to the ceiling or to the sky or into outer space, but in time we still know even that will fall.